There are two types of jaguars. There are the melanistic jaguars, and the regular yellow with black spot types. They are the third largest cat in the world. It kills in one bite to the head right behind the brain. This is do to the powerful jaws. They have the strongest bite among all the cats, except for the clouded leopard who is almost as powerful. Jaguars closely resemble the leopard in the phisical aspect. The jaguar is one of the biggest cats in the world after the lion and the tiger. This animal is commonly mixed up with the leopard, but it is stockier, with a broader head and a shorter tail and legs. It has dark spots, on its neck and head. Then there are also dark rings on the body with dark spots in the them. These spots are the distinct difference between leopards and jaguars. The color of the jaguar is a tawny yellow. Some jaguars are black and are found in dense forests. They are called melanistic forms as well as black panthers. The tail is usually about 30 inches long, and they grow to be about 4-6 feet in length. 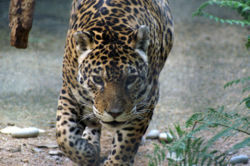 The jaguar weighs from 124–211 lbs. Any jaguars larger (which is highly uncommon) weigh from 288–333 lbs. The smallest jaguars weigh about 80lbs. Most females are usually 10%-20% smaller than the males. The jaguar stands anywhere from 27-30 inches at the shoulders. Sizes seem to range larger from the northern to southern regions. Studies of jaguars on the Mexican coast show they are about 66–110 lbs. This is about the size of a cougar. With studies of the jaguar in the Brazilian Pantanal they seem to grow to about 220 lbs. The short and stocky limb structures are made for climbing, crawling, and swimming. Jaguars can pierce a turtle's shell showing it has great strength. It is also the strongest feline, and the second strongest in the jaws among the mammals. A study of bite force with the adjusted body size showed it the strongest of all the felids. Only the clouded leopard was close to the jaguar in the study. Its been said that an individual jaguar can drag an 800lb bull 25 feet in its jaws. Jaguars are usually located in tropical rainforests, arid scrub, and wet grasslands. Most of the jaguars like dense forests or swamps with a ready supply of water. Geographically they are located in the Southwestern United States all through Central America and even the Northern part of South America. 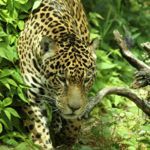 Jaguars feed on capyabara and peccary, and they will even eat cattle. Sometimes they will even eat crocodile and small rodents. Its powerful jaws are able to kill the prey in one bite. Instead of hitting the neck like the other cats do, they go for the temporal bones of the skull and kill extremely fast. Mostly they stay on land even though they are able swim well. They have different calls they use can communicate with other jaguars, and they also use their scent to mark territory. Jaguars will either be diurnal or nocturnal depending on their problem or habitat. They also usually don't have any predators to deal with because of their power. Their only predator is man. With no rivals for food and territory they don't have to deal with other animals. In the 1900's jaguars spread from Southern California and western Texas down to South and Central America. Jaguar populations are dwindling down to almost nothing, and some are even completely extinct in certain areas. It is also threatened by extinction in the future. In the 1960's there was 15,000 jaguar skins being sold a year in the Brazilian Amazon. In 1973 the Convention on International Trade in Endangered Species sharply brought a drop in the sale of jaguar pelts, but it still was not enough to stop the declining populations. Jaguars used to have a 37% higher range in the world then they do now, do to killing and hunting them. The other reasons they are dying are the deforestation, competition for food with humans, and the ranchers who kill the jaguar on site. Jaguars will adapt and eat the largest food source that is can get and use it for its primary source of food. This page was last modified on 7 March 2014, at 20:20.